According to C.G. Jung consciousness is comprised of four aspects -thinking, feeling, sensing and intuiting. It is almost impossible to separate one aspect from another for they are inextricably joined in our body-mind. MARI accesses all four functions of consciousness. 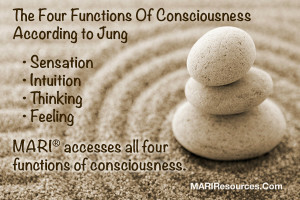 The intuitive function is activated from the beginning of a MARI session. The subject is first asked to create a drawn mandala. A drawn mandala consists of a white piece of paper and a box of at least 24 pastels. The ideal paper is a white 12″ by 12″ square. A pencil drawn circle about as big as a dinner plate is the only thing on the paper. The directions are simple -“Surprise Yourself.” The subject decides which color to start with, where to begin, how to fill in the space and whether or not they want to fortify or stay within the line. This process is totally intuitive and often reveals very interesting unconscious information. The choices of symbols and colors on the MARI are also totally intuitive. They are simply asked to allow themselves to be drawn to six symbols they like or are most attracted to and one symbol that they don’t like or are least attracted to. The subject is then asked to think of an issue in their life. They are asked to think about it as clearly as possible. Typically, issues are broad, unclear, diffuse, connected to other issues. The subject is told to try to be as clear about the issue as possible. They are asked to simplify the issue into a sentence if possible and then to let this issue run through their mind. While they are thinking of the issue and allowing it to run through their mind, they are directed to allow their eyes to find a symbol that seems to represent help or guidance for the issue. There are several important aspects to the guidance cards. First, once the subject has chosen their symbols and the colors that seem to go with these symbols, they will be given feedback. In other words, they will enter into the thinking and feeling aspects in the same way as a counseling session. For this reason, it is important to get as much information as possible from the client while they are still in the intuitive function. It is important to call attention to the fact that the subject is asked to “think” of an issue. This is important because the thinking function is verbally introduced into the intuitive function. This introduction of one aspect of consciousness into another is important and requires a different orientation to the chosen symbols and colors when feedback is given. The new neurological information is exciting. We can now identify exactly where the brain processes a word or an image. The visual cortex is activated, not only when the subject chooses symbols and colors, but more importantly when the subject is given feedback. While research with an fMRI has not yet been done with MARI, we can glean from similar research that there would be a tremendous difference in the brains of subjects who are sitting and talking as in traditional therapy and subject who are doing MARI. The brain of a person doing MARI would reveal countless neurological connections lit up, firing and connecting to other parts of the brain. Now that we are developing the instruments that show us what is happening in the brain, we cannot diminish the neurological impact when the client ‘sees’ their life in symbols and colors. The visual comprehension when seeing his or her symbols and colors placed appropriately on the Great Round is light years ahead of doing therapy with only two aspects of consciousness. The impact of the visual is at least two fold. There is the initial impact. MARI is the only instrument that provides a visual picture of our psychic contents. Never before have we seen this. And the fact that the individual chose the symbol and color and then sees this combination placed on the Great Round is far different that a therapist telling the client that they seem to have good or bad self esteem or more serious issues. This picture is pregnant with layers of information that evoke memories, feelings and insights. We cannot underestimate the power of the visual image and its impact on the body-mind. This is a pregnant moment for the subject – they actually see the issue. It registers in the psyche and it is up to the subject to bring forth their thoughts and feelings. They can identify the symbol and stage with how they feel. At this important moment, the last thing the practitioner wants to do is create any kind of negative self-fulfilling prophecy. Typically, clients will readily abdicate their sense of themselves to a professional. MARI practitioners are trained to avoid creating any kind of negative framework. The response from the subject is key. The client holds all the power. If they deny or can’t identify with heaviness, then the meaning might be noted, but is quickly dropped. Very often the heaviness seen at one stage is reprised elsewhere on the MARI -and sooner or later an accurate picture that is a true reflection of the subject and that the practitioner senses is correct -emerges. Either way, the subject is in control. After all the feedback is given and the practitioner determines that the subject is ready, the real work, within the same session, begins.